The Cavaliers are doubling down on a team strength and adding one of the best floor spacers in the NBA. 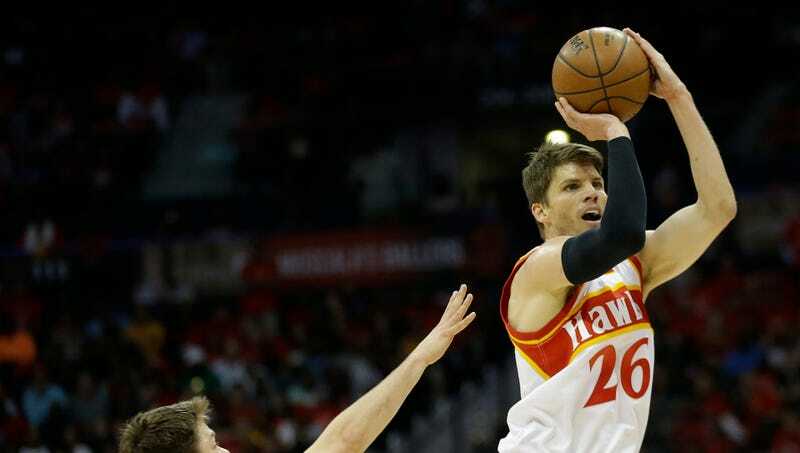 Per Adrian Wojnarowski, the Cavaliers are finalizing a trade for Atlanta Hawks three-point specialist Kyle Korver. It’s not clear who exactly the Cavs will give up (Mike Dunleavy? A future first? Some cans of Skyline Chili? ), but it doesn’t appear that prying Korver out of Atlanta will cost them anyone foundational. It’s not as if the Cavaliers pursued Korver to make up for a specific team deficit. Korver isn’t as one-dimensional as he seems, but he doesn’t really take any shots from under 16 feet and Cleveland acquired him to do nothing but fire away from deep. He stands to benefit from LeBron James’s immense gravity and step into shots with more space than he ever saw in Atlanta. It’s one thing to run into pockets of hardwood opened up by Dennis Schröder’s movement and passing, but Korver is going to have pastures in front of him in Cleveland. Cleveland is already shooting the second-best percentage from three in the NBA this season and taking them with the second-highest frequency, and Korver’s addition will likely improve both. He holds the single-season three-point percentage record and is a career 42.9 percent shooter. He made his first all-star team two years ago, when he was 33. This trade could mean that J.R. Smith’s thumb injury is worse than originally diagnosed, or that the Cavs simply want a better shooter to play the Mike Dunleavy role. If that’s true, then they will have swapped Dunleavy out for the best possible replacement.